Way back in the deep cupboard above the fridge, among the jumble of hideous vases, unused fondue pots, forgotten jars of homemade preserves brought as party gifts and an entire box of licorice allsorts from Christmas 2007, is our waffle iron. Actually, it’s our daughter’s waffle iron, bought as a birthday gift a few years ago after she expressed a desperate need for homemade waffles. “I like pancakes better,” she said after the first batch. So, there it sits, next to the cocktail shaker that hasn’t been used since that horrible Cosmopolitan Christmas Eve (No, that’s not true. Christmas Eve was actually pretty good; it was Christmas Day that was a little rough. And, the kids really under-appreciated the unique and interesting ways their toys were assembled). Every once in a while – when I am searching for a light bulb or chucking in some more junk – I see it. I always think, we should have some waffles. I was looking at it just the other day and I was tempted to admit that our daughter is right – that at heart we’re pancake people – and give the thing away. Then, that very afternoon, I stumbled across this recipe. Coincidence? I don’t think so. More like divine intervention. Our waffle iron is saved! Making cookies is a novel way to get some use out of that derelict waffle iron you got as a wedding gift (I’m just guessing). These are super fast, chewy good and actually a lot of fun to make. Try them with ice cream. Dust off the waffle iron and put it on to heat up. Melt the butter and whisk it together in a large bowl with the brown sugar, eggs and vanilla extract. Mix in the flour, baking powder and salt. Add the oatmeal and chocolate chips and mix well. 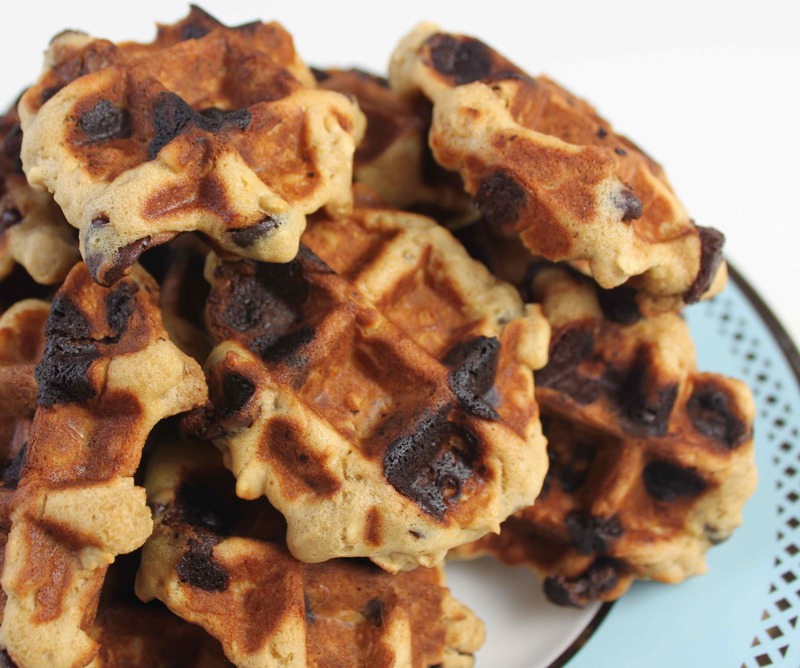 Spray the hot waffle iron with nonstick cooking spray and place a tablespoon sized dollop of cookie mix in each of the four sections of the waffle iron. Close the lid and cook (bake?) for about 2-3 minutes until they are just brown. Remove carefully to cooling rack. Repeat. Enjoy. This entry was posted in Breads and Pastries. Bookmark the permalink. I remember that Christmas Eve. Although I have a family member who remembers very little of it. Ingrate kids not appreciating your creativity! Yum… these look fantastic! Apparently, I need a waffle maker! Thanks. I’ll sell you mine, cheap!